Dow Honda | 2015 Honda Vehicles | Proximity Key Entry and Pushbutton Start: How do They Work? Proximity Key Entry and Pushbutton Start: How do They Work? Proximity key entry and pushbutton start are becoming a common tech feature throughout the Honda lineup. 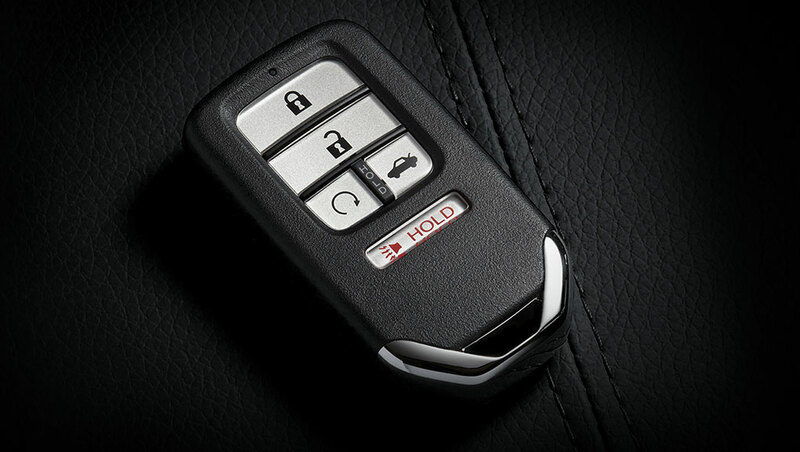 The key-fob is the linchpin of the proximity key entry and pushbutton start technologies. By simply having the key-fob 32 inches away from your Honda, you can unlock the doors and start the engine without a traditional key. But how do these features work? Let’s find out! When the key is 32 inches away from the vehicle, touch the door handle for it to automatically unlock. To unlock all doors, touch the front passenger door handle. With the engine off, shut the door, and press the lock button on the handle. While the vehicle is in Park, press and hold the brake pedal. Then, press the “Engine Start/Stop” button to start the engine. While the vehicle is in Park, press the “Engine Start/Stop” button to turn the engine off. If you have any questions about proximity key entry and pushbutton start, click here to contact us! If you would like to try these features out, click here! Want to learn more about Honda technology? Click here for more information about the automatic tailgate! Click here to learn about the Magic Slide Second Row Seats! Click here to for more details about the Honda Satellite-Linked Navigation System!